The Sinn 900 Flieger Chronograph is a variation of the Sinn 900 Instrument Chronograph, and features many of the advanced technologies pioneered in that watch. The differences lie primarily in the dial, hands and markings, which are of a traditional pilot's watch rather than an instrument watch. This watch represents the largest pilot's chronograph that the company has created - Sinn calls this model "Der große Fliegerchronograph" with a case diameter of 44 mm. 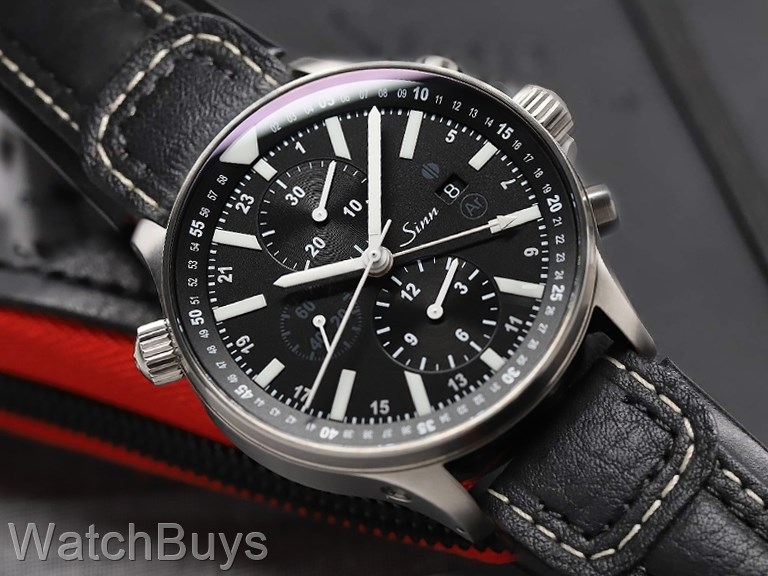 The Sinn 900 Flieger Chronograph is a dual time zone chronograph, featuring two registers, sweep seconds, date and second time zone indications.Unlike most other Sinn dual time chronographs, this watch shows the second time zone as a 24 hour zone rather than 12, making calculations with AM and PM simple. This watch features Sinn's "Tegiment" technology. Standard steel used by most watch companies has a hardness of between 200 and 240 HV (Hardness Vickers is a common scale used to measure material hardness). The Tegiment layer has a hardness of 1,800 Vickers which is nine times harder than standard steel. Satin stainless steel Tegimented case with solid case back. Sapphire crystal with luminous hands and hour markers. Watch is water resistant to 20 ATM. Black calf leather strap with tang buckle. Verified Owner Comments: After weeks of research to find the ultimate GMT pilot watch, I found it in the Sinn 900 Flieger. 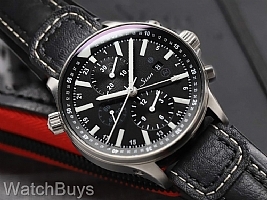 This is exactly the watch I was looking for: classic pilot watch look with a large stainless case, black face and high-contrast easy-to-read markings; chronograph function; GMT hand; and a rotating bezel. Not to mention German tech and build quality at a very reasonable price (I love the tegimented case and the super long-lasting lume). It's amazing that these watches aren't more well known at this point... yet! I'm so glad I found the Sinn rather than going with either the Breitling Navitimer or IWC Pilot watches that I was also looking at. Suffice it to say, I would highly recommend the Sinn 900 Flieger, and the experience of buying through WatchBuys was first rate. Verified Owner Comments: This is such a beautiful watch. I can't stop looking at it. The weight and feel of it is impressive. Functionality is there; I like using the rotating bezel and chronograph which I find handy. The second time zone is a good feature. When the watch arrived it did not include a strap replacement tool. I spoke with WatchBuys and they confirmed the tool only comes with the 900 Flieger with the bracelet. The watch did come with a small strap that I learned could be used to tie the watch to a flight suit. Overall, simply a great timepiece.